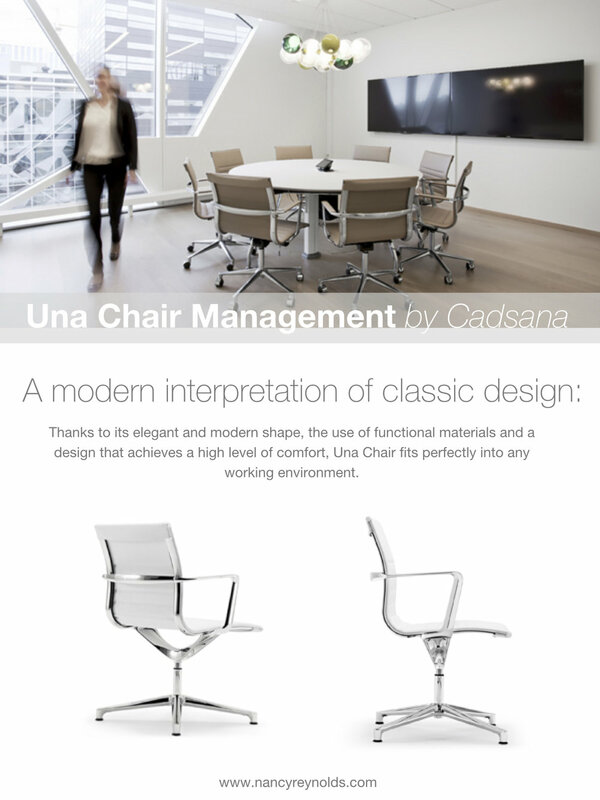 Una is an elegant office or conference chair with a simple, casually formal aesthetic. 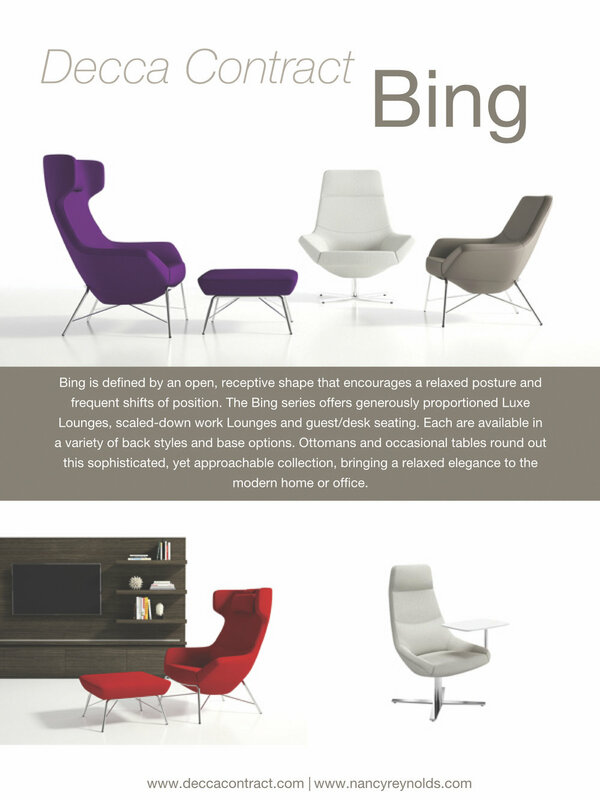 Available in two back heights (mid back and high back), two upholstery styles (sling or soft pad), two arm styles (aluminum or aluminum with arm sleeve), and two frame/base finishes (aluminum or polished chrome). Bases include 5 star with casters or 4 star with auto return mechanism. Chair mechanism can be specified as swivel or swivel tilt. Please contact your local representative for samples and prices. Following are pages from the latest update from Tuohy. A PDF copy of these pages is available to download. Over the past half century, through the ebb and flow of design trends and business cycles, the contract furniture industry was born and has matured. Interior design itself has become a profession in its own rite, heightening the importance of design in the American workplace. Today, Tuohy has earned a national and international position as a premier provider of high-end design and manufacturing for executive workplace furnishings. Much of what Tuohy’s products and services are today has been driven first by the collective voices of designers and customers worldwide. Tuohy's mission is to pair their dreams for a better workplace with deployment of Midwestern ethics. Tuohy Genevieve occasional tables offer fine craftmanship, featuring a rich and elegant interplay of metal-and-wood, or metal-and-Avonite®. Inspired by International styling, forms/details are geometric and abundantly clean. Seating Designer statement: "Solid and soft. Classic and contemporary. Simple and sophisticated". The new Tuohy Furniture website has been activated. We recommended that before you visit, you clear the cached memory on your computer/device to remove previously stored pages. Click image for video and further information. 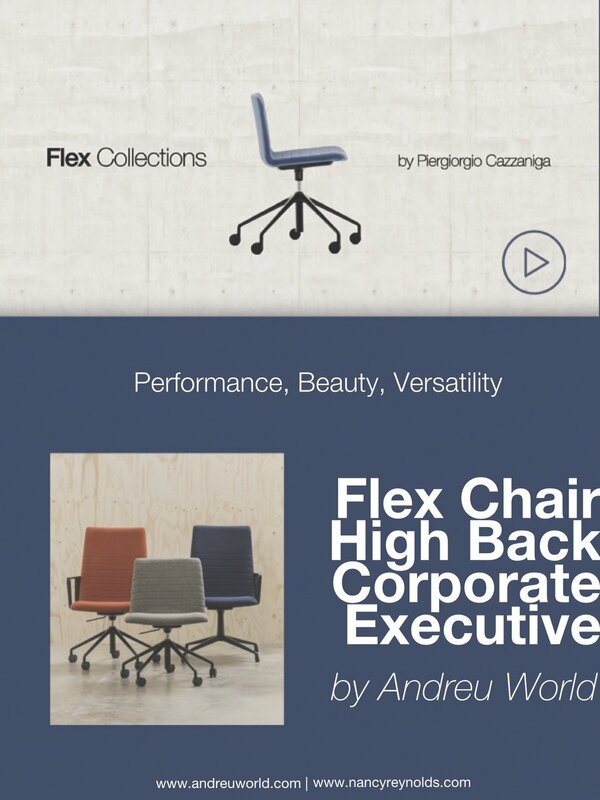 Andreu World's designs examine possibilities. The AW design team is constantly pushing to improve comfort, finish and function. 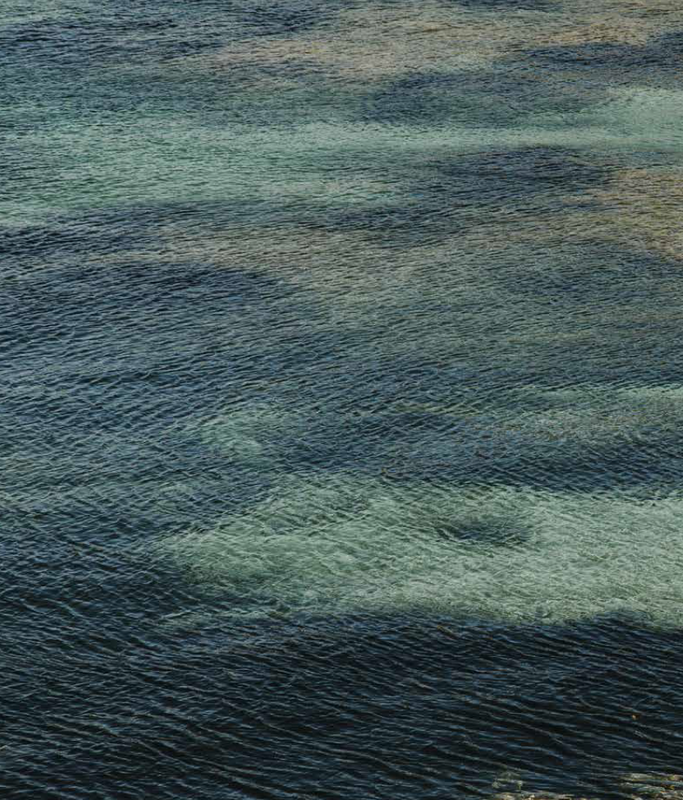 Each of their products allows for intelligent use of raw materials. Working on the basis of creativity, versatility, ergonomics and comfort, Andreu World develops products that anticipate trends in contemporary furniture design. Stories is a new graphic publication that seeks to go a step beyond Andreu World products and, through them, talk about the culture, architecture and design with which Andreu World identifies with. This installment contains twelve stories that try to convey the industrial culture and nature of Andreu World as a manufacturer as well as their relationship with architects and designers that inspires and enriches them on a daily basis. Download the complete Andreu World Story Series 03 [pdf] here. Beat is a living form. It is not a square, it is not a circle. Its contour differentiates it from classical forms and gives it value and dynamism. Accompanied by occasional tables or alone, it can be a seat, a footrest or a place to support. Carlotta is the result of experience and mastery in woodworking, with a wood frame without sharp edge and with all its joints perfectly resolved and flush to achieve the effect of a frame carved from a single piece and molded in its entirety. generates a personal and great three-dimensional aesthetic. Manfred is a program of sofas that allows for multiple combinations. 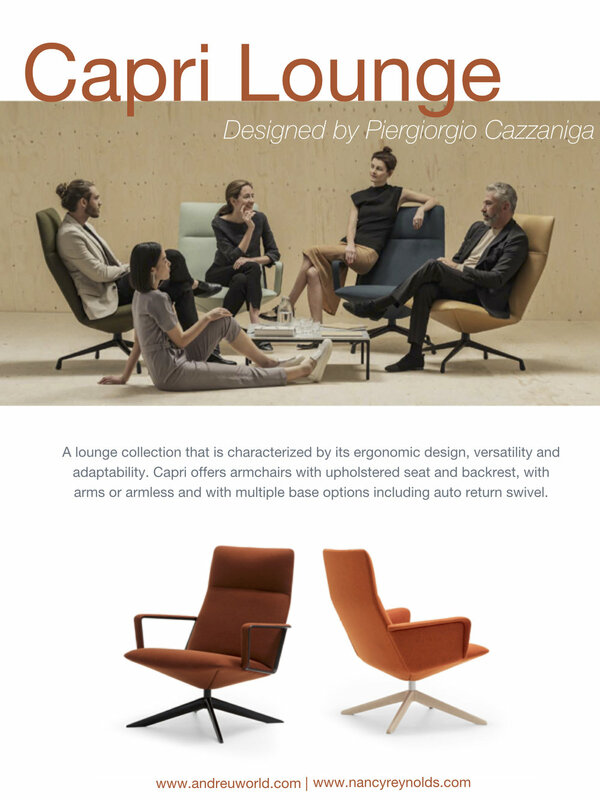 It is available as a lounge chair and two or three person sofa with and without arms. Its characteristic platform creates the effect that its upholstered volume is suspended in the air, providing a suggestive contrast. 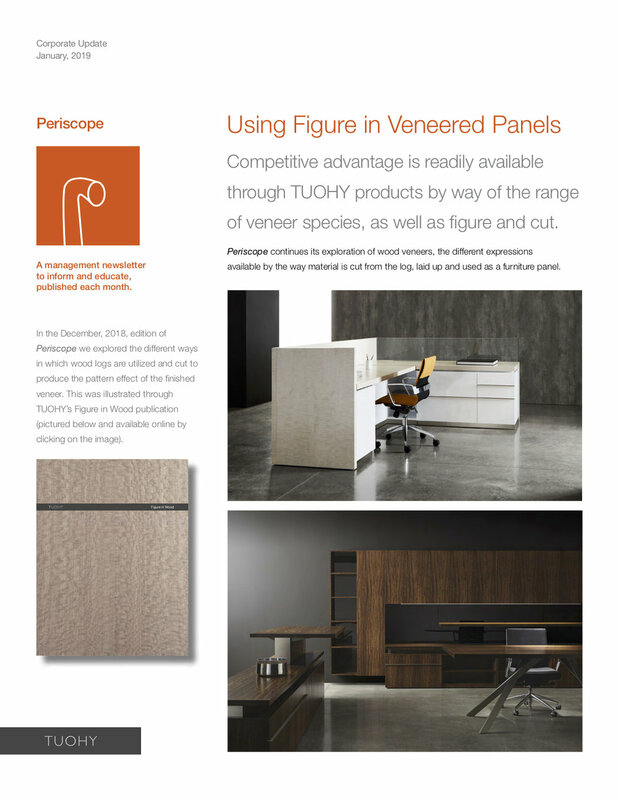 Tuohy introduced several new products at NeoCon 2018 in Chicago. 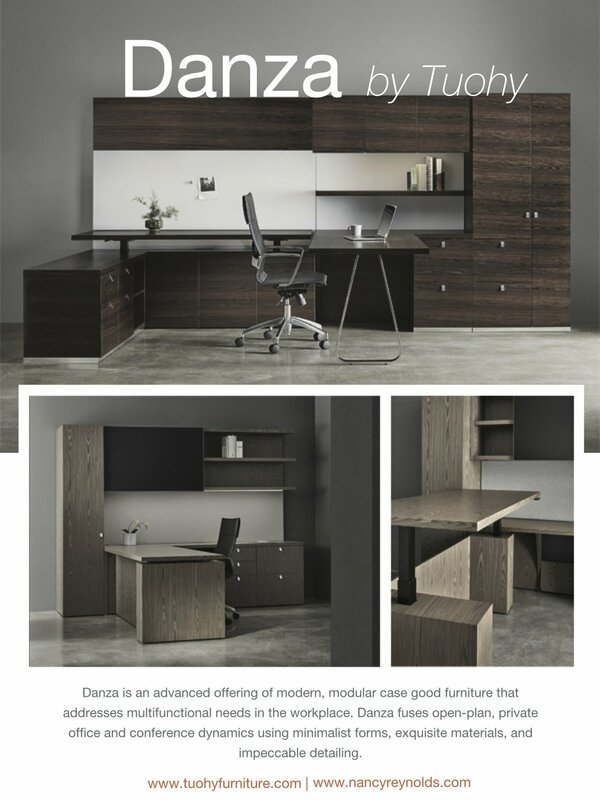 The Danza Collection is an advanced offering of modern, modular case good furniture that addresses multi-functional needs in the workplace, fusing open-plan, private office and conference dynamics through minimal forms, exquisite materials, and impeccable detailing. Danza consolidates the leading features used in contemporary workplace planning and delivers them in a disciplined, value-driven program. Danza’s interchangeability of components across various workplace levels preserves continuity of design and efficient asset management for owners. 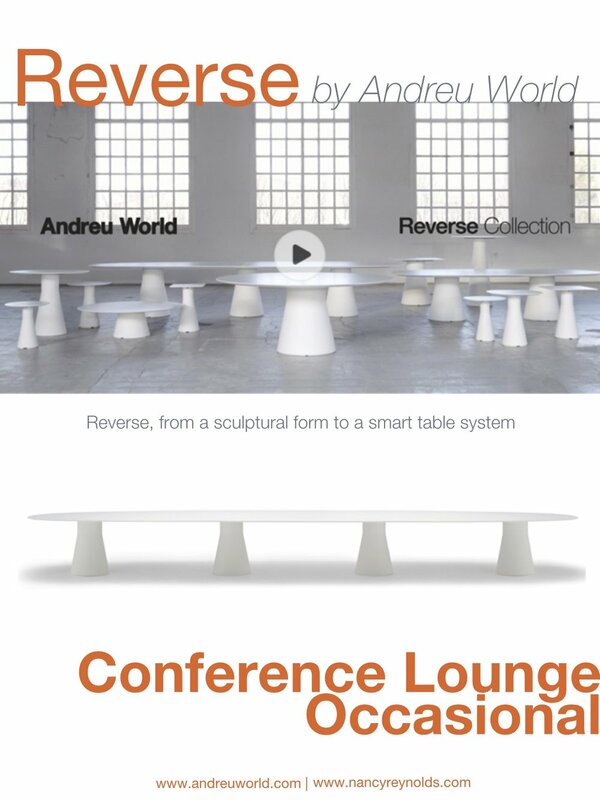 Table-benches, two conference table collections, a lounge furniture collection with companion occasional tables, and a guest chair represent the portfolio of new products introduced by TUOHY at the NeoCon trade fair. The products strike a balance between iconic, brand-building design, and TUOHY’s ability to bring value to a competitive project. 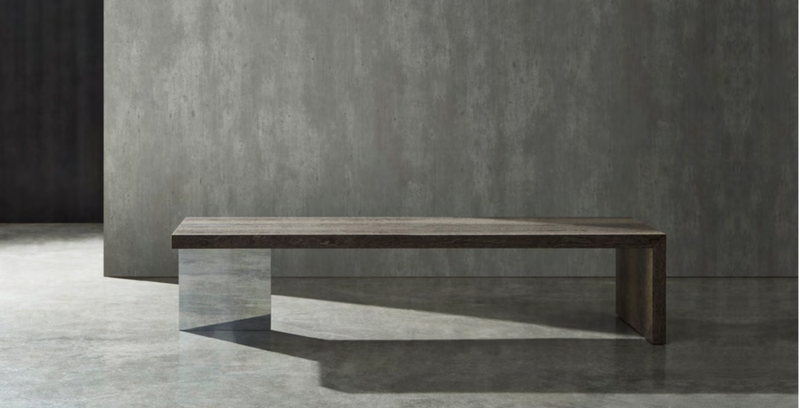 The Bau Table, designed by John Nelson, features a metal blade slicing through a cantilevered top and mitered end panel. The table is also available as a bench with optional seat pads and fixed mounting. 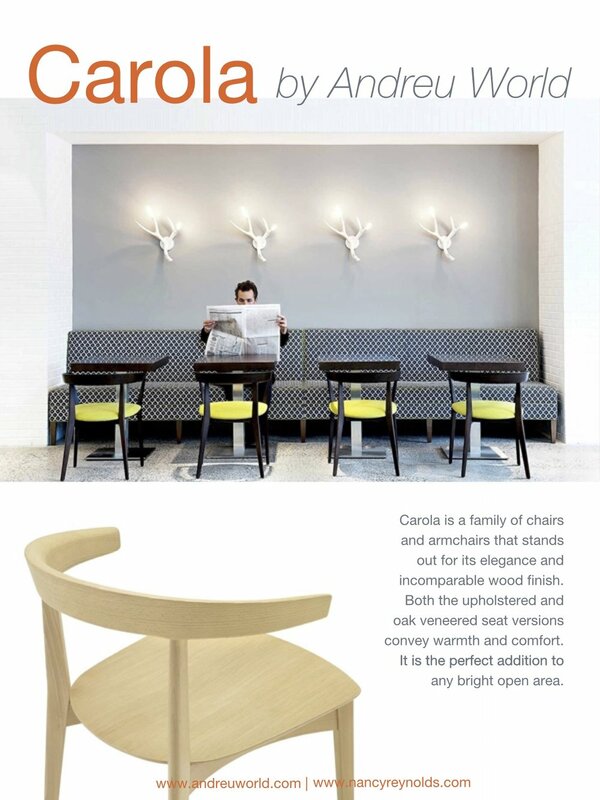 The bench is well suited for public spaces, atria, and lobbies where fixed placement is desired. The Duende Table (below), by METRICA, features formed aluminum bases and an engineered top core that facilitates long, open expanses and myriad materials. 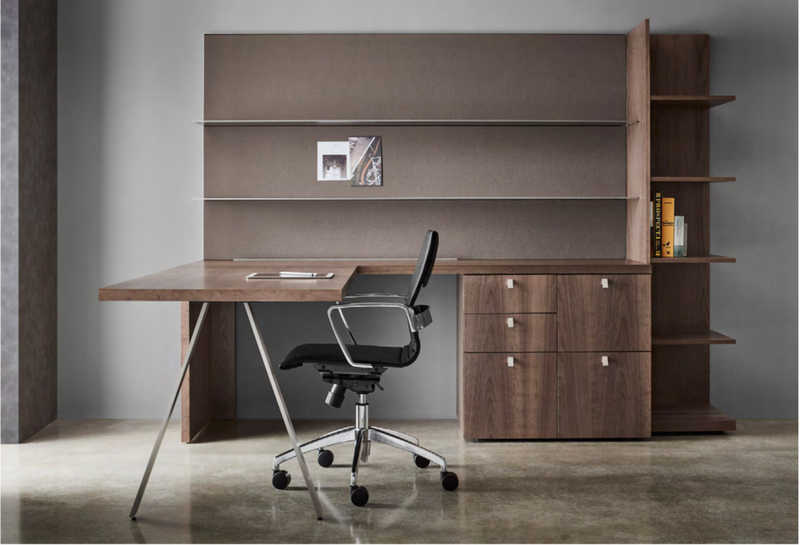 The Rhoi Collection, designed by Fig40 of Toronto, is a comprehensive collection of approachable work tables. The splayed leg and apron-level sub-top structure, support mixed materials and open top spans. 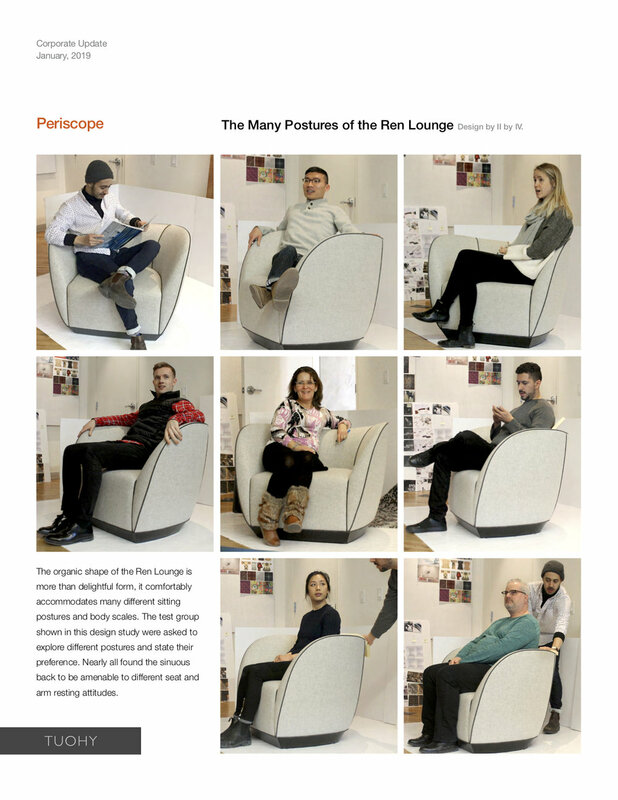 The Ren Collection (below), from II BY IV DESIGN, is defined by its undulating curves which suit myriad postures and work styles and is suited for commercial offices, hospitality and residential spaces. John Nelson extended his Genevieve family of seating and table products to include the Genevieve Guest Chair, which uses a metal frame, inset into the upholstered body. 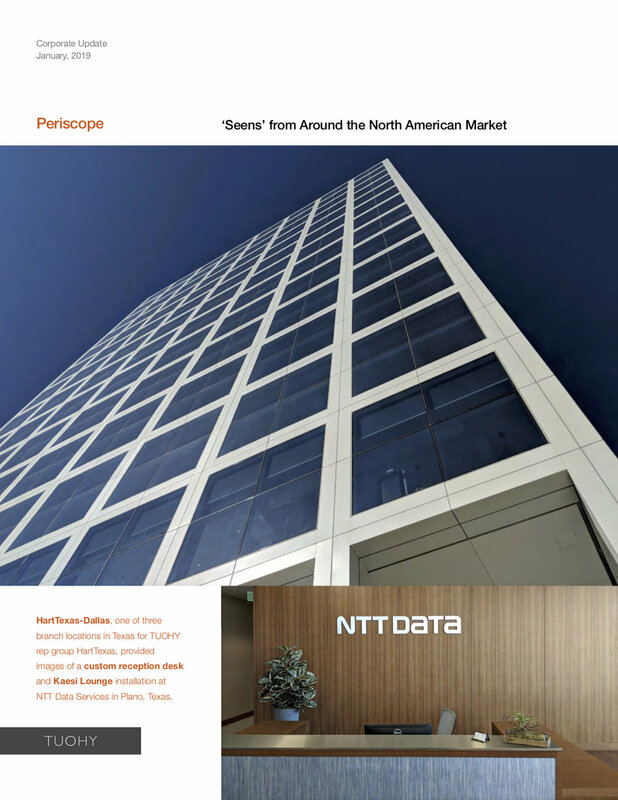 See Us at NeoCon 2018! 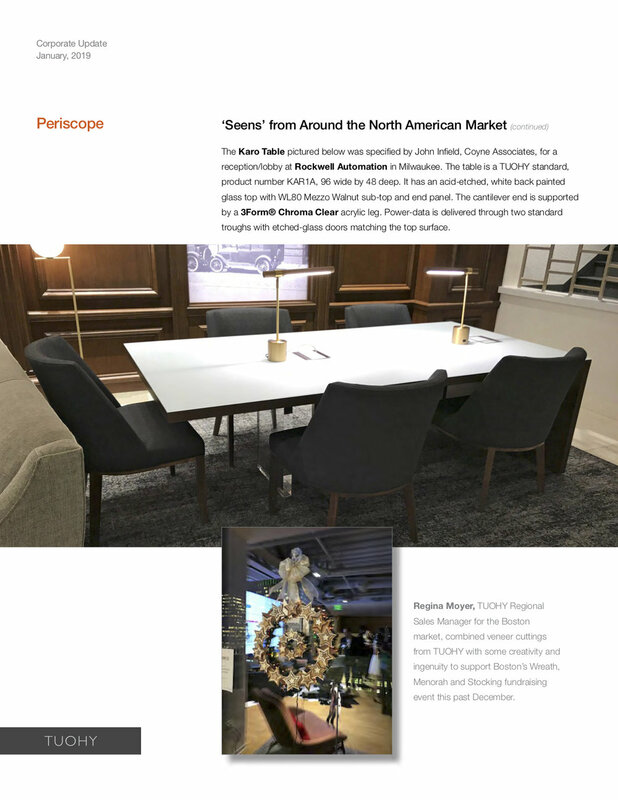 If you are in Chicago for Neocon 2018, look for Nancy Reynolds Associates representatives and visit the showrooms of our manufacturers. Following are the details of our manufacturers' Merchandise Mart showrooms.